Point Reyes bird’s beak (Cordylanthus maritimus ssp. palustris) is a unique hemiparasitic halophite native to salt marshes on the coasts of Oregon and California. It is only found in tidal salt marshes, leaving many of the populations exposed to the threats of filling, tidal manipulation, and water pollution. The US Fish and Wildlife Service lists this species as a Species of Concern and the Oregon Department of Agriculture considers it to be Endangered. There are 18 known occurrences of Point Reyes bird's beak within the state of Oregon, with the colonies’ populations averaging 2,000 individuals. 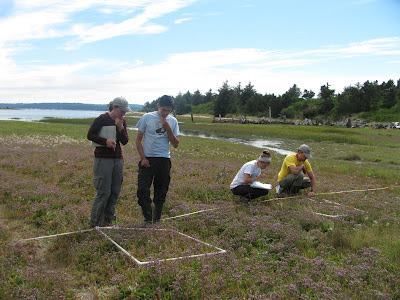 The population that is currently monitored by the Institute for Applied Ecology (IAE) is located on the North Spit of Coos Bay within a BLM Area of Critical Environmental Concern (ACEC). Monitoring began in 2010 and has continued annually in an effort to track changes in population size and location. IAE also collects plant community data to analyze Point Reyes bird's beak's preferred habitat. 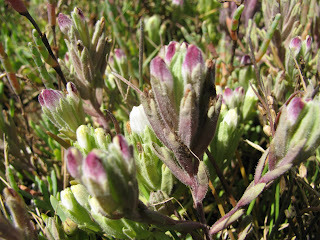 Point Reyes bird’s beak is an annual that blooms June through September and produces fruits August through November. This species reproduces from seed, but requires very specific levels of salinity in the marsh in order for the seeds to germinate. There is some evidence indicating that Point Reyes bird’s beak is a self-pollinator, unlike similar species which require pollinators. This plant is a member of the Orobancaceae family, which consists of holoparasitic and hemiparasitic plant species. Hemiparasitic plants, such as Point Reyes bird’s beak, can produce some of their own energy through photosynthesis, but also utilize underground root connections to derive resources from neighboring plants. 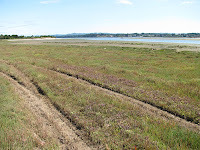 While this particular species lacks host specificity, it is commonly found in association with Virginia glasswort (Salicornia depressa), marsh rosemary (Limonium californicum) and marsh jaumea (Jaumea carnosa). IAE crew members (L to R: Erin, Eddie, Charlotte, Guy) monitoring community composition and population density along transect. In recent years, the BLM took action to protect a portion of the North Spit population by diverting an access road around the largest grouping of plants. In the first several years of monitoring on the North Spit, the primary research objectives were mapping population size and testing the effects of interspecific competition between Point Reyes bird’s beak and its associated species. After it was determined that there was no competition effect presented by surrounding species, research shifted to focusing on population mapping and, starting in 2012, comparing population size and success of protected versus unprotected areas. Ten transects within the protected area were monitored in order to collect data on community composition and species density. Data on the density of Point Reyes bird’s beak, the associated plant community, and habitat type were recorded within each meter sampled, and were used to estimate the number of individuals present within the entire population. This year, four new transects were established within the unprotected portion of the population to provide a functional comparison of the effects of human disturbance (e.g. ORV use). The primary threat to this specific population continues to be human disturbance, but additional threats include water pollution. 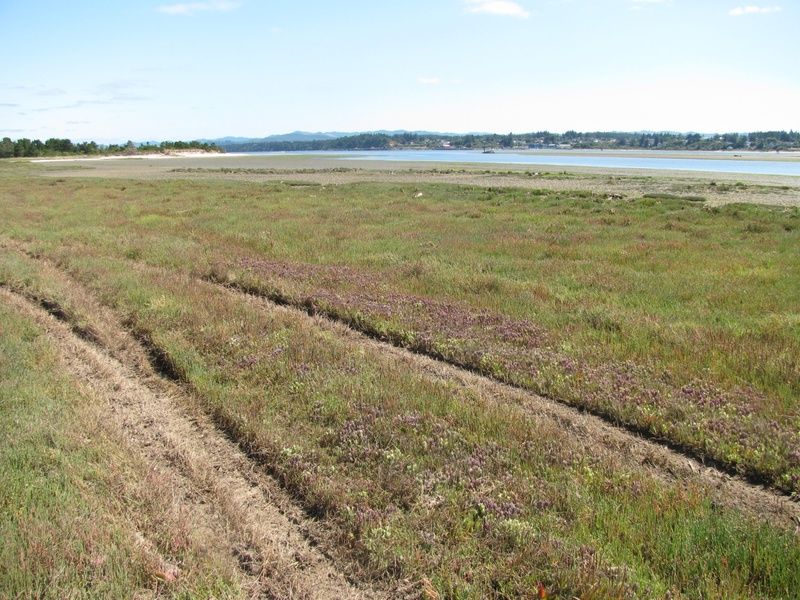 Individual populations can be affected by changes in microtopography of the marshes due to sand accretion, changing tidal patterns, or recreational and industrial uses in close proximity to the habitat. Continued monitoring of the population size and habitat will provide information about how the North Spit population responds to disturbance pressures and can be used to inform future decisions about management and protection. Actual, I only started discovering this a few years ago. It can show me a best way on this idea. This is very amazing able website on research.appliedeco.org.We are getting many kinds of support by this website.I also like this website. I will preserve this Looking for Ola Flowers? Visit Olaflowers.blogspot.com. There is always an occasion that requires flowers in everyone's lives. Find the best Ola Flower today.